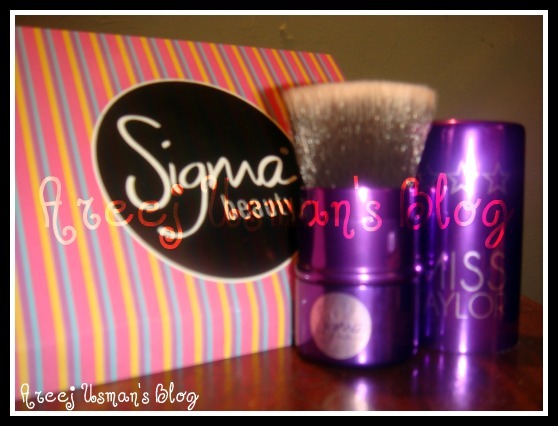 Here I am with another post about one of our favorite Cosmetic Brush makers..Yes you are right I am talking about Sigma & the product that I am reviewing today is the Sigma Miss Taylor Retractable Kabuki Brush. Lets have a look at this beauty. Get some Hollywood Glamour! The Sigma Makeup retractable flat top kabuki is the easiest way to apply powder products such as blush, bronzer, foundation, and highlighter on-the-go. Practical and classy, the Hollywood Glamour collection is a must! Featuring the SigMax fiber for high definition application. 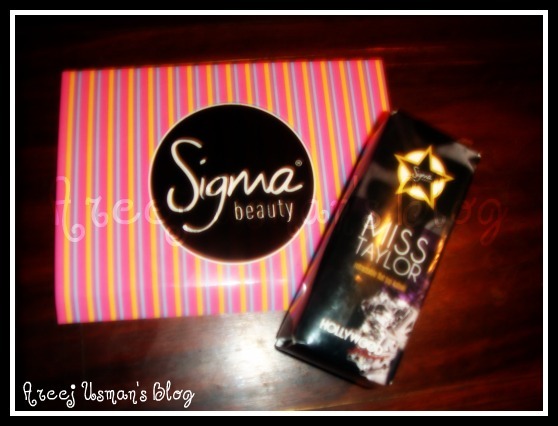 I received this brush a few days ago from Sigma Beauty for review & it reached me just on time like the last delivery.The packaging was very good as the brush was in a little box and wrapped up in bubble wrap in a bigger cardboard box. Before this brush the other brush that I own by Sigma is the Sigma F80.I feel like as both are Kabuki brushes so there are a lot of similiarities between them both.Its like having a smaller version of F80 & in a different form.This brush is extremely handy to carry around and u can always carry it in your bag when you are on the go.Its a multi purpose brush and is perfect to apply Liquid & powder products both.You will not have to worry about taking all your brushes with you as you can easily apply Foundations,blushers,bronzers & ofcourse highlighters. As I am more of a face powder user I ll definitely always carry it everywhere with me.The important thing is that its bristles are extremely soft and fine in texture.I feel that it isnt as densely packed as other kabuki brushes but has just the right amount of bristles.Its product picking power is very good it definitely works very smoothly on the skin.its feel is just as soft as a feather & I am not at all exaggerating. 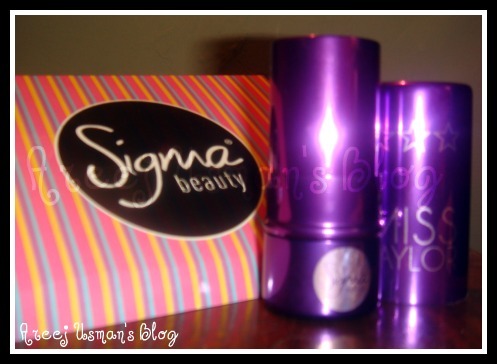 This brush is from Sigma’s HOLLYWOOD Series thats why its called Miss Taylor & comes in a metallic purple pacakaging that I absolutely love.I somewhere read that it makes a clink clink noise when carrying around in a bag.I tried that as well but mine doesn’t make any noise as the retractable portion is quite in place and isnt loose or anything.Once the cap is fit and is in a bag you dont have to worry about it getting opened and the bristles getting off or the brush loosing its shape as the cover wont come of unless you take it off. I have made a couple of powder applications with this brush and each time i have looked closely for any bristles coming off but I didnt notice any. Overall I must say that I am again in Love with another Sigma Brush & this time its the Miss Taylor.I would totally recommend this one to all of you who are always on the go & want to travel light.Just one brush and such a multi purpose one, who wouldn’t want to give it a try. Thanks a lot for reading.If you have any questions feel free to ask & comment. i am also going to receive this one 🙂 super excited .. which camera do u use to take pics ? the color of the brush is so gorgeous and girly,i badly want a brush like this to carry in my bag. @Jeeya I have used my Sony Cyber shot for the pix.